Google has announced that come April 21, 2015, mobile friendly sites will rank higher on the godfather of all search engines. Quite often, changes to Google’s search algorithms send a lot of site owners and developers into a tizzy, but quite frankly responsive web design has been around for a while now and it was only a matter of time. Last year Google started highlighting mobile friendly sites in search results – so this comes as no surprise. With the increasing use of mobile devices and internet users spending more time online on said devices(smartphones and tablets mainly), efficient search results should give priority to mobile friendly websites. If you want to be able to compete for your targeted keywords, responsive web design and/or a dedicated mobile app should be given top priority. A mobile friendly site is not only good for SEO(Google), but has advantages when it comes to sales and leads. How many times have you visited a site on your smartphone, got frustrated because it wasn’t mobile friendly and left? You would think that by now all businesses(especially those selling products and services from their website) would have recognized the need for a mobile friendly site – sadly, this isn’t the case. Some business owners spend thousands of dollars on extremely complicated websites without paying any attention to responsive web design. The fact is that if your site isn’t mobile friendly, visitors will LEAVE – plain and simple. One-third of all web pages now(as of January 2015) served to mobile phones, a 39% increase in one year. Mobile marketing in the US expected to generate $400 billion by 2015, compared to $139 billion in 2012. Consumers now spend 60% of time online on mobile devices. Over 50% of all mobile searches lead to a purchase. Almost half of all consumers polled say they won’t return to a website if it isn’t mobile friendly. In 2015, mobile local searches are expected to exceed desktop searches for the first time. Can Your Business Survive Without A Mobile Friendly Site? Do a search on mobile statistics and you just might be astounded at the rapid growth(and buying power) of consumers and internet users on mobile devices. 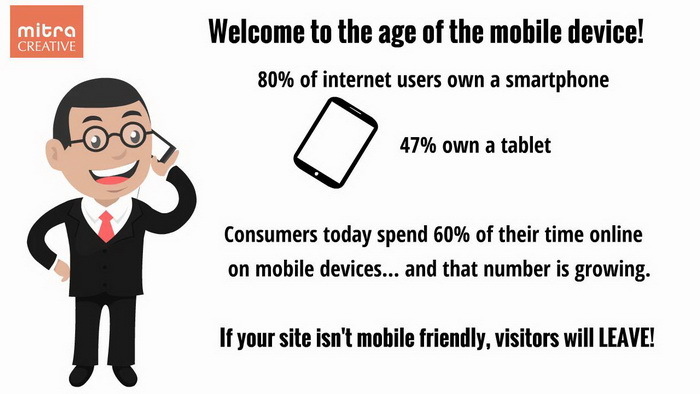 Can your business really afford not to have a mobile friendly site? Will your website and Google ranking survive the changes come April 21? Would you like to grow your sales and leads by tapping in on the growing number of mobile internet users? Are you finding it harder and harder to compete in your niche/industry? Talk to a Mitra Creative today about mobile friendly solutions and responsive web design.